Today was the day of the day trip to Delos, the sacred island where the sun god Apollo and his twin Artemis are said to be born. To get to Delos, you need to take a boat, run by Delos Tours which has a counter at the docks. Without a tour, the price of the return trip is 17 euro. The guided tour package is 40 euro for a 1.5 hour group tour and the return tickets. I chose the tour group because I haven’t done my reading on the island. The tour was booked through my hotel. The boat for the guided tour leaves at 10:00 am. The lady at the hotel told me it would be better to reach at 9:30 am so I had to call for a cab. 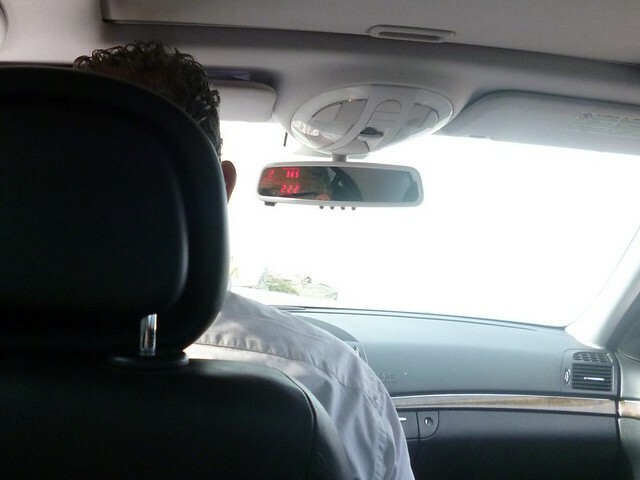 Along with the booking fee, the cab fare was 7 euro from the hotel to not-even-near the Delos dock. The meter seemed to jump really fast. Each 3 meters, it jumps by 1 cent, leading my heart to jump along with it. With my voucher, I collected my boat ticket and a sticker that signified that I was on the guided tour. The boat that went to the island was quite large and had two levels. I really wanted to stay in the shaded lower level but felt that it looked odd when everyone else was on the upper deck. So I head up and sat under the sun. The trip to Delos seemed to take forever as the sun gave my left shoulder a good sizzle. Even covering my shoulders with a shawl didn’t seem to help much as the heat still soaked through the thin synthetic fabric. The boat finally landed at Delos. Everyone swarmed out and there was a slight confusion as no one really knew which area to gather for their own tour group. There were two English tours that day. One had a Union Jack as a sticker while the other, which I was on, had a half smiley face sticker. Our tour guide was Joanna who wore a Beatles t-shirt and a baseball cap. 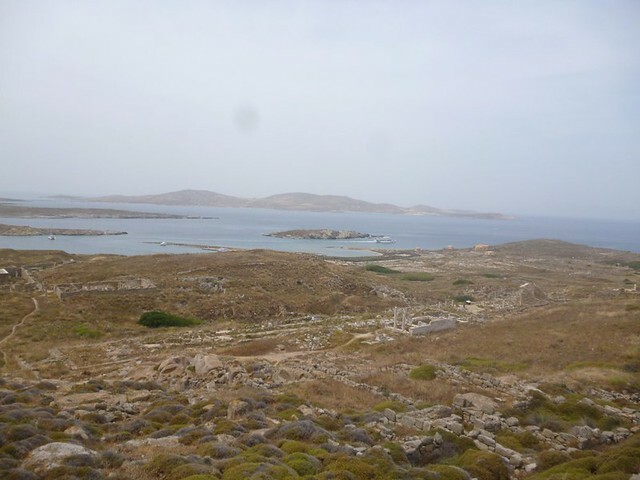 Our first stop was the residential area of Delos. The only remains left of the place were stone walls with stones stacked high without using any cement. 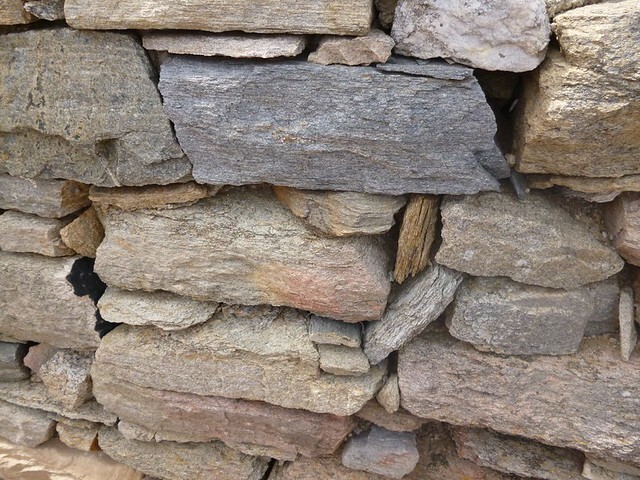 This was the Greek way of building walls: stacking stones with smaller stones in between so everything would stay put. 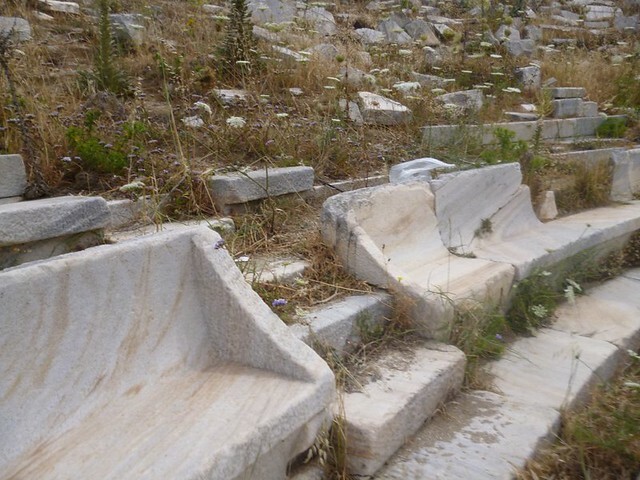 The walls that we saw were mostly stone but in the past, the Greek would put a layer of material outside of the walls so that the surface is smooth. At the House of Dionysus, we saw a replica of a marble mosaic that had a head with wings, floating on a tiger. The head and wings belonged to Dionysus, the Greek god of wine, entertainment and theater. Dionysus was popular among the common people because everyone likes to partaaay. In the same house, we could see the remains of a stone staircase heading up and also a room with a drain which functioned as a private toilet. At another house, we saw a window with marble frames. On the marble, there were holes. Back then, there was metal railing in the window and the room was a bank of sorts. Next stop, Joanna brought us to the ancient theater. Most of the marble seats were gone but some of the front row seats were intact and even had backs. Our visit to the residential area ended after looking at the House of Cleopatra where two statues were found. One of the statues had the name Cleopatra so the house was named that way. This wasn’t the same Cleo as the one who died of a snake bite. Next up was Apollo’s sanctuary and his alleged birth place. 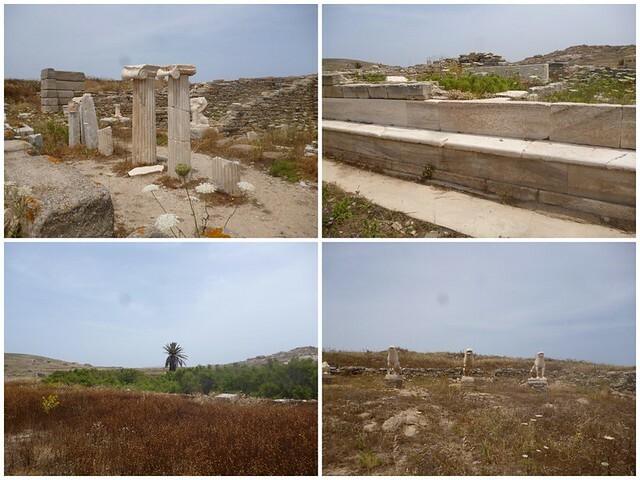 Here on Delos, there wasn’t much left of Apollo’s sanctuary. There were marble foundations and some lonely columns lining the paved road to the temple but it required a very good imagination to see the things as it was in the past. In the distance, a single palm tree marked approximately where Apollo was born. There used to be a lake there in the past but the present archaeologists filled the lake up because it was breeding malaria-carrying mosquitos. There were also a line of marble lions near the temple. The replica lions were rather slim and had the same ravaged looks as the original. When the tour ended, we had time to spare. There was a boat leaving at 1:30pm but I decided to stay on the island and leave on the last boat at 3:00pm. When the boat that leaves at 1:30 pm left, I was worried that I would be bored with the island. In the end, I wasn’t bored at all. I went around exploring after I took a look at the museum’s rather sparse collection. I had wanted to climb up the tallest hill but I gave up. It was a little embarrassing that I couldn’t make it to the top as I saw many retirees sprinting up. Halfway up the hill, there was a temple with the sign Temple of Isis. The half broken statues of a goddess inside didn’t look like the Isis I know. It had a flowy robe. I took a wrong path on my way down. The path might have led somewhere in the past but I only had plants that clung to me desperately and an end that required me to jump down 2 feet to the ground. Many lizards lived on the island. Most of them were colorful with stripes of bright green or blue. The boat back to Mykonos sounded its horn 30 minutes before departure. 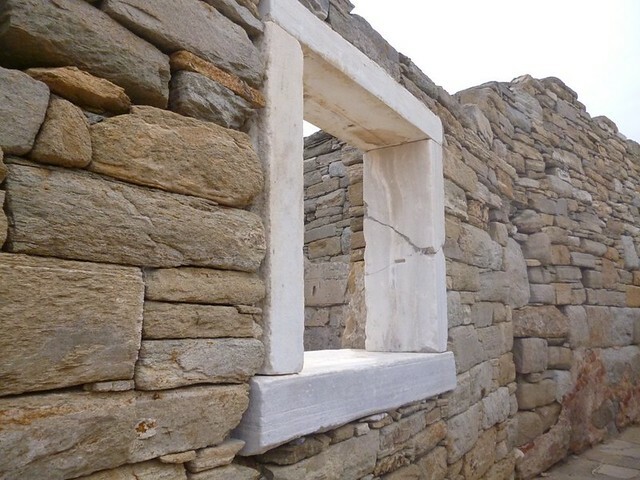 When we left, Delos turned back into the empty place with all but the archaeologists, birds and lizards staying back on the sacred island.